Acidity, Acidy, Acid. Usually, the pleasant tartness of a fine coffee. Acidity, along with flavor, aroma, and body, is one of the principal categories used by professional tasters in cupping, or sensory evaluation of coffee. When not used to describe cup characteristics, the term acidity may refer to pH, or literal acidity, or to certain constituents present in coffee that ostensibly produce indigestion or nervousness in some individuals. After-Dinner Roast, Espresso Roast, Continental Roast, and European Roast. Terms for coffee brought to degrees of roast ranging from somewhat darker than the traditional American norm to dark brown. Acidity diminishes and a rich bitter-sweetness emerges. 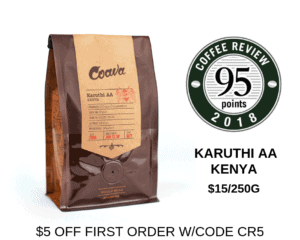 Among many newer American specialty roasters, roast styles once called by these names may in fact constitute the typical, “regular” roast of coffee. Aged Coffee, Vintage Coffee. Traditionally, coffee held in warehouses for several years, sometimes deliberately, sometimes inadvertently. Such aging reduces acidity and increases body. Aged coffee has been held longer than either old crop coffee or mature coffee. Recently, some Indonesia coffee has been subject to a sort of accelerated aging involving deliberate exposure to moist air, much like India’s monsooned coffee. Alajuela. Market name for one of the better coffees of Costa Rica. Altura. “Heights” in Spanish; describes Mexico coffee that has been high- or mountain-grown. American Roast. Coffee roasted to traditional American taste: medium brown. Americano, Caffè Americano. An espresso lengthened with hot water. Ankola. Seldom-used market name for arabica coffee from northern Sumatra. Antigua. Market name for one of the most distinguished coffees of Guatemala, from the valley surrounding the old capital of Guatemala Antigua. Aquapulp. Terms for a procedure in which the sticky fruit pulp, or mucilage, is removed from freshly picked coffee beans by scrubbing in machines. Mechanical demucilaging is gradually replacing the traditional wet processing procedure of removing mucilage by fermentation and washing. Arabian Mocha. Single-origin coffee from the southwestern tip of the Arabian peninsula, bordering the Red Sea, in the mountainous regions of present-day Yemen. The world’s oldest cultivated coffee, distinguished by its full body and distinctively rich, winy acidity. Arabica, Coffea Arabica. The earliest cultivated species of coffee tree and still the most widely grown. It produces approximately 70% of the world’s coffee, and is dramatically superior in cup quality to the other principal commercial coffee species, Coffea canephora or Robusta . All fine, specialty, and fancy coffees come from Coffea arabica trees. Aroma. The fragrance produced by hot, freshly brewed coffee. Aroma, along with flavor, acidity, and body, is one of the principal categories used by professional tasters in cupping, or sensory evaluation of coffee. Arusha. Market name for coffee from the slopes of Mt. Meru in Tanzania. Automatic Filter-Drip Coffee Makers. Coffee brewers that automatically heat and measure water into a filter and filter receptacle containing the ground coffee.